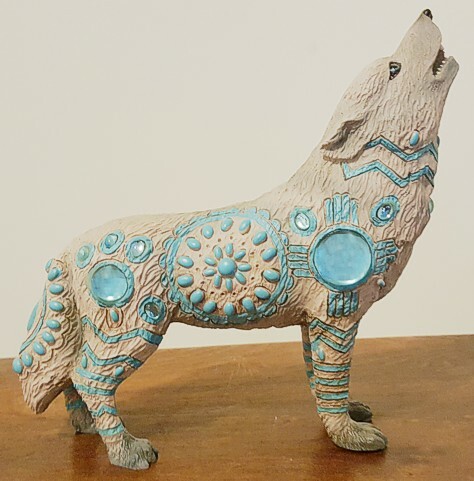 We love, love, love this Indian Turquoise Wolf Figurine. The howling Wolf is adorned with a beautiful design and glass gems. The colors are truly breathtaking. This gorgeous Wolf figurine is fashioned out of cold cast resin and it is painstakingly hand painted. It comes in a white gift box and would make some Wolf lover very happy as a gift. Pictures do not do this fabulous figurine justice. Size: 6 1/4" x 2 5/8" x 6 1/8"